James Gutholm, Associate Director of C&C, Network Services has done a recent review of our mail systems and has shared some of the recent trends. Specifically looking at the amount of spam and malware that are filtered through the Evergreen mail servers he says “At the height of spam, ~2 years ago, we were getting about 1.3 million messages per day. I think the worst day we saw was ~1.7 million with 99.7% being spam.” Take a look at the graphs to see how hard the spam filters are working and how much is getting bounced on a regular basis. This is a strong improvement from where we were 5 years ago. According to many sources (Symantec, Eleven) the amount of spam worldwide is in a modest decline (debatable), but malware and malicious bots are on the increase. This is especially true for mobile platforms and, of course, Facebook. 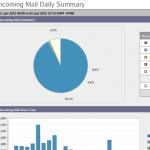 Click here for the image that provides the Incoming Mail DailySummary from the IronPort device running on campus. This entry was posted in Featured on June 4, 2012 by rip.